This week I took more photographs than normal, but that’s because I went to a Birthday Party 🙂 I had quite a selection this week, but went for one that actually surprised me, since I never thought I could see this particular scene in this was, very little of the wires that I always see in this general area. Not much to say about it really, just a photo I like. It is of the National Library, here in Guyana. 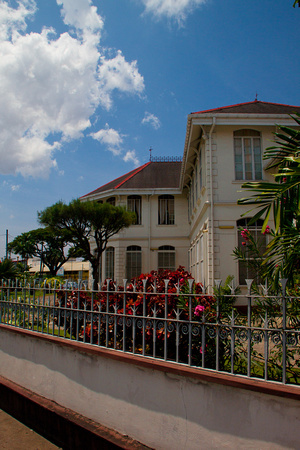 The Library sits at the corner of Church Street and Main Street, it faces the Bank of Guyana. I am not sure which I prefer, to take a ton of photos and have endless difficulty choosing one, or to take 5 and have no problem 🙂 Nah, I think I will take a ton of photos. Its more fun that way. Very clean shot. Does not look like GT. I have the same challenge in my town, however there aren’t any buildings as lovely as this to worry me about it! This is beautifully composed and the colours are wonderful!